Shaka was the illegitimate son of the Zulu chief, his mother exiled to hide the fact of his birth. He joined the Mthethwa army and proved a fierce warrior, and immediately began to change warfare. 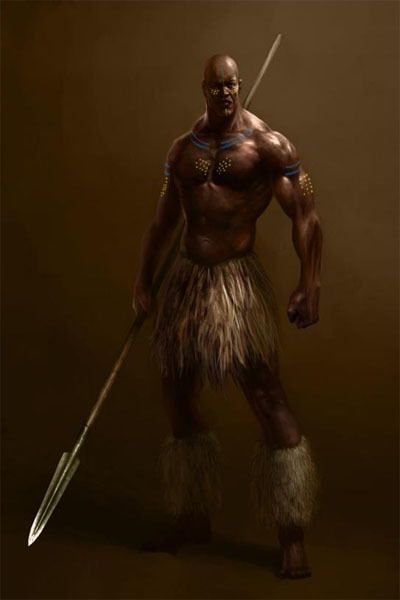 Shaka disliked the flimsy throwing spear, and developed the stout thrusting spear. 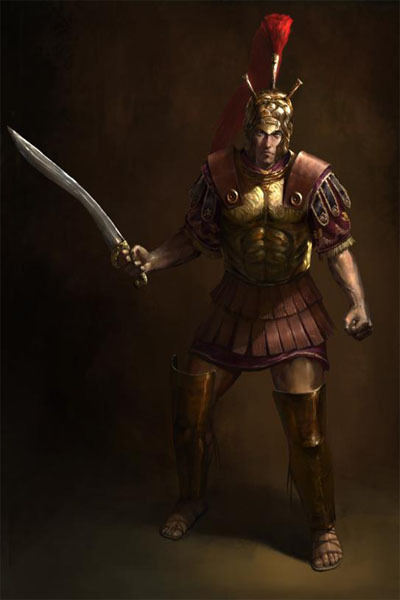 He forced his warriors to walk barefoot on thorny bushes, instead of wear sandals. He also made their shields larger. Shaka made his case for leadership of the Zulus when his father died in 1816. The Mthethwa chief supported Shaka, and the apparent heir was eliminated. Thus Shaka became chief of the Zulus. The Zulu’s antagonistic neighbors, the Ndwandwe attacked Shaka’s 4000 troops with as many as 10000. Using the terrain, new fighting style, and weapons the Zulus sent the invaders fleeing. The Zulus continued to add to their empire by absorbing tribes. Often they absorbed fighting-age men into their army and preferred to leave the chief in place- sometimes this was not possible. By 1824 Shaka had secured his empire by defeating the Ndwandwe. The reasons why are still debated, but in 1828 his half-brothers assassinated him along with a member of another tribe. Imbemba and Shield: The Imbemba axe’s blade was crescent shaped. A tang on the inside of the curve attached the blade to the handle. Some Zulu axes had an upper edge that extended beyond the end of the haft. Unlockable Weapon: Knobkerrie (club) and Shield: The knobkerrie was a club with a large ball on top, carved from the trunk of a small tree. They are usually the length of a walking stick and were used for both hunting and warfare. Iklwa: The iklwa was the spear developed by Shaka to replace the throwing spear. Named for the sound it made when being pulled from a body, it was used more like a sword than a spear. Unlockable Weapon: Assegai: The assegai was a long spear with a shaft made from the wood of the assegai tree. The blade was extremely sharp and the whole spear was effective at 50 yards or more. Iwisa (throwing club): The iwisa was a wood club designed for war. It was carved from the densest wood available- ironwood if available. Iwisa were used whatever way would be most effective– as a club or a thrown weapon. Unlockable Weapon: Umkhonto (throwing spear): The umkhonto was a throwing spear, originally used for hunting. The tang of the spear’s head was mounted in a medium-length hardwood shaft. It was effective up to 30 yards. Traditional Hunting Gear: Zulu hunting gear was simple. A strip of hide was wrapped around the waist, cowhide covered the rear and common furs (monkey, civet) covered the front. Coverings above the waist were rare. Royal War Gear: Conquistador Armor: Zulu chiefs were permitted to wear the skin of the leopard, and would wear a necklace of the leopard’s teeth. Royals would also wear beaded necklaces and bracelets to show their wealth.